Earlier today I was driving through downtown Hillsboro on First Street and something caught my eye. I drove by, kept going but something inside told me to go back. I turned around, parked the car and walked over to this. 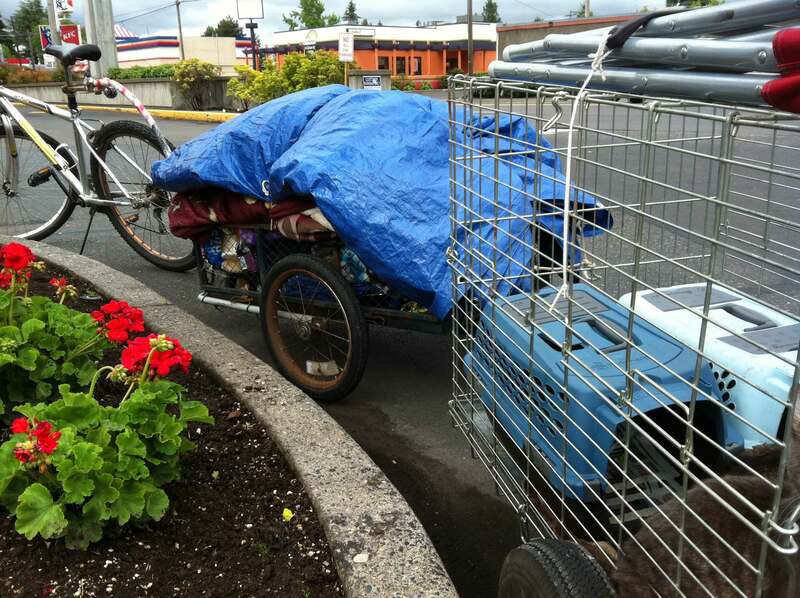 A bicycle attached to a trailer attached to a cage. 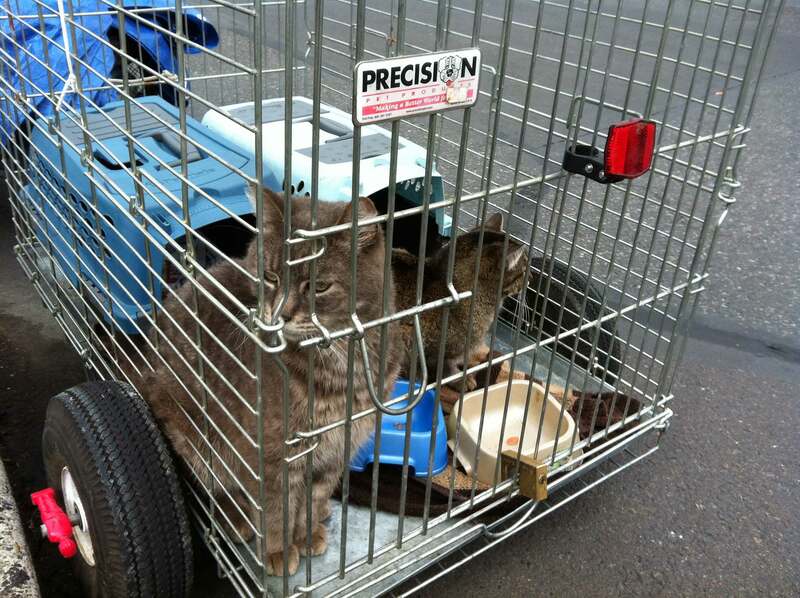 At first I was taken aback to see these cats in this small cage in a very busy parking lot. They were very friendly and didn’t seem to mind the noise of the constant traffic. I sat and pondered the whole scene. Obviously the person that owned them was homeless. As I scanned the trailer with their belongings, I saw a blue tarp and blankets, a few clothes, a camp chair tied to the top of the cage, a bottle of soda and what looked like a small bag of cat food. I waited and pondered some more hoping to meet the owner and ask about their life. The owner didn’t show up. They could have been inside one of the stores watching me and perhaps not wanting to talk about their life, to be questioned on their choices. I could make up a story but I am sure it would not come close to the realities of living on the street. I would want to make it a happy story, one of love, perseverance and courage, not a sad story of losing everything but your cats, struggling to find a dry, warm and safe place to sleep and wondering where your next meal is coming from. What I do know is that this person must have a huge heart to take care of these kitties while struggling to take care of themselves. I hope that I will have the opportunity to meet and serve them. I will continue to look out for them for I am my brother’s (or sister’s) keeper. I do hope you get to meet the owner of these kitties. Thank you for having a kind and caring heart. If only we could all see the trials each one of us has and to be more compassionate. I just discovered your blog through a link @Julie Fei- Fan Balzer. Your work is lovely, thank you for sharing. I’ve seen them at least twice on 25th. I thought the same thing. I’m glad at least they can be together. I’ve heard more shelters are allowing pets.